LOS ANGELES (AP) — “Ralph Breaks the Internet” may star an arcade bad guy with powerful hammer-like fists, but the animated sequel is also packing a punch with strong female characters. Sarah Silverman, who returns as the voice of Vanellope von Schweetz, credits Disney for including more impactful female roles in the new film, which comes out Wednesday. Her character is one of the leading ladies, along with new cast members Gal Gadot’s Shank and Taraji P. Henson, who plays Yesss. With the “Ralph” sequel, the studio is taking “girl power” a step further as directors Phil Johnston and Rich Moore wanted to incorporate more “strong and complicated” female characters. The sequel is a follow up to the 2012 Oscar-nominated “Wreck-it Ralph.” This time, Ralph and Vanellope’s friendship is tested after leaving Litwak’s video arcade to travel through a Wi-Fi connection that ultimately delivers them into the fast-paced internet dimension. They venture into an unfamiliar world exploring major brands from Twitter to Amazon, online shopping, the dark web and visits inside Walt Disney Studio’s website. Johnston said the film’s imaginary of the internet mimics the look of a New York City or Tokyo. It’s where Ralph and Vanellope meet Gadot’s Shank, a gritty street-racing star, and Henson’s Yesss, who is the head algorithm of the trend-making website BuzzzTube. 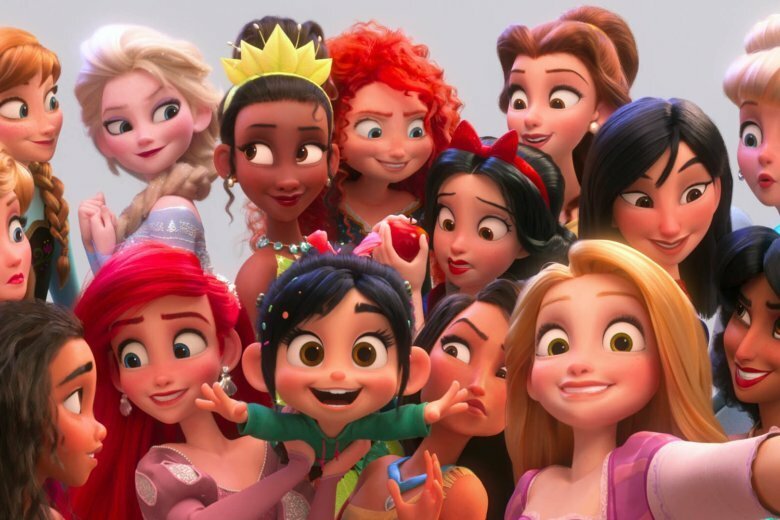 “Ralph Breaks the Internet” offers an animated glimpse inside their parent company’s website showing several characters from Marvel to “Star Wars.” The film also highlights the Disney princesses in a scene where all stereotypes and cliches associated with the animated icons are dealt with head-on. Initially, the princess scene faced backlash from fans in August after a publicity photo surfaced online showing Princess Tiana with lighter skin and a thinner nose compared to the version in the black character’s stand-alone Disney movie, “The Princess and the Frog.” The studio ultimately reanimated the character after meeting with actress Anika Noni Rose, who voiced Tiana in the 2009 film, and members of Color of Change, a civil rights advocacy organization. Henson called Tiana’s reanimation a “brilliant move” by Disney.